Oriental Shorthair Cat Patti – Photo: copyright © Helmi Flick – Lilac (dilute chestnut brown). Please respect copyright. You could almost sum up this breed in one sentence, perhaps two. This breed of cat is, what I would call, the Modern Siamese in different clothes (except it is a bit heavier/bigger2). However, cat fanciers wouldn’t refer to the prefix, “Modern”. Siamese cats are now known as the slender fragile looking (but not actually fragile) cats that we see at cat shows. The Traditional Siamese is known as the Thai by some. Although the Thai cat (a TICA registered cat) is between the traditional and modern in my view. The word, “oriental” refers to a slender body shape. This cat is then no different to the Modern Siamese except for the wide range of coat colors and patterns (300 in all4). In fact a very well known commentator1 on the cat fancy writes about the Siamese/Balinese/Oriental Shorthair/Oriental Longhair together under one title. The similarity causes cat associations recognition and registration problems. Do associations register them as Oriental Shorthair cats or Siamese cats? Some cat fancies classify them as Siamese2, the CFA and TICA (major USA registries) don’t. This cat is not a particular favorite of mine as I prefer a more old fashioned conformation, but looking at the stylish head and shoulders “portrait” of Patti above (by Helmi Flick), this can be an extremely attractive cat. There is a longhaired Oriental cat as well, which carries the recessive longhaired gene. You can see a large format still photo that came out of the photographic session in the video below on this page. The CFA hit the nail on the head when they say that the Oriental Shorthair Cat was developed to “explore” a wide range of coat colors and patterns. In the breed standard the CFA say that the whole point of breeding this cat is the coat color. Someone must have chosen this body type with which to do the exploring. This may have been a mistake bearing in mind that most people prefer the shape of the traditional Siamese. This is confirmed by the Polls being run on this web site. You can see the preferences in respect of the Persian (Ultra and Traditional) and the Siamese (Modern and Traditional – vote and see the results) by clicking on the links. The non-pure bred domestic cat fits the bill for a standard shaped cat of many patterns and colors so this breed (in my opinion) is intended to be a mirror of that cat, in terms of coat types, but in a more svelte body – see cat body shapes. When you see these cats in person, close up, you get the full impact of their very delicate and slightly unusual appearance. They are to my mind not very large cats either, which adds to this slightly rarefied image. 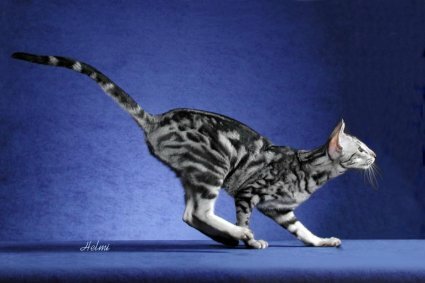 Perhaps, indicative of the need to rationalize the cat registries and/or create a global cat registry; for a while in the UK the spotted tabby Oriental Shorthair was called an Egyptian Mau (a different breed, which you can see by clicking here). 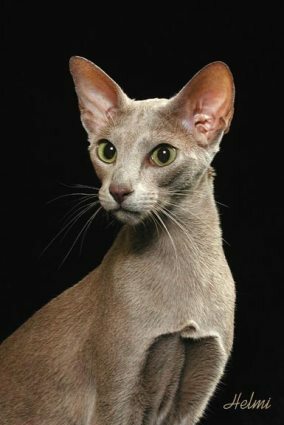 Also, there appears to be current confusion over naming in that in the UK the Chestnut Oriental Shorthair is called the “Havana” but this is not the cat breed known as the Havana Brown in the USA. Orientals that were blue (diluted black – grey/blue) were imported from Thailand (formerly Siam) in the 1800s2. These might have been what the cat fancy refer to as Korats. Solid (“self”) coloured Siamese cats were brought over from Thailand in the early years but in the 1920s Siamese cats were declared to be only pointed and blue eyed by the Siamese Cat Club of Britain2, the non-pointed non-blue eyed cats were referred to as “non-blue eyed Siamese”4. About half of Oriental Shorthairs are solid colored2. In Britain, the solid chocolate was developed in the 1950s, which led to the Chestnut Brown Foreign, which was recognized in 1957 and is the origin of the Havana Brown in the United States. 1950s Date of origin2 This conflicts with the date below. 1970s Oriental Shorthair cat created. 1995 Bicolor added to the range of coat patterns/colors and accepted by CFA (note: this is said to have happened in 19854). CFA combined Oriental Longhairs and Shorthairs into one breed group called Orientals2. 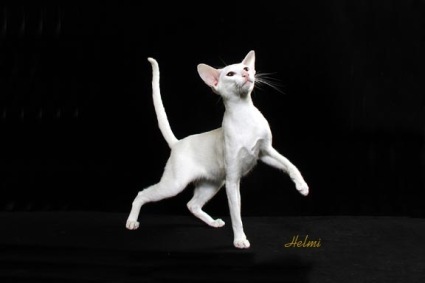 For the appearance of the Oriental Shorthair cat you can do no better than look at Helmi’s pictures. You can see a large format slide show of some more excellent Oriental Shorthair cats by clinking on this link together with a discussion on the breed standard. As mentioned, this breed has the widest range of color/pattern types (300+). Above: Photo: © Helmi Flick – this is a thumbnail – please click for supersize. This is a silver classic tabby cat. Solid: This type of cat is “self colored”. This results in a solid coat color. The color is uniform throughout, with no agouti gene banding of the hair follicles and no tabby patterns etc. 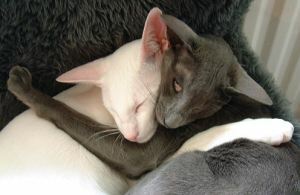 The white Oriental Shorthair is called “foreign white “in Britain (with only blue eyes) and oriental white (with green or blue eyes) internationally2. The solid colours must be even. Tabby: his is produced by the Agouti gene and is the classic pattern with which we are familiar on moggie non-purebred cats. The brown spotted tabbies were called “Maus” as they no doubt resembled the Egyptian Mau but this caused some confusion. “The quality of the pattern is an essential part of the cat”3. Parti-color: solid color with patches of red or intermingled red on the body and extemities3. Bicolor: It is the piebald gene (white spotting gene) that produces the bicolor pattern being white + another color. Shaded: You can see a red shaded Traditional Persian cat (Orlando) here to see how the coat looks (the page opens in a separate window). Orlando is a fabulous Traditional Persian. Smoke: This is another form of shaded and visa-versa. They are both a form of tipped coloration in which the shaft of the hair follicle is white (for the silver series) or golden (for the golden series). Smoke tipping is heavier than shaded tipping. The character of the Oriental Shorthair Cat is the same as the well known Siamese, namely, talkative, outgoing, energetic and playful. They are very social. This implies that “input” from the human companion is required. Domestic cats that are described as intelligent and this breed would be an example, usually demand a higher commitment to care. In other words you will have more of a relationship with your cat, at least potentially. 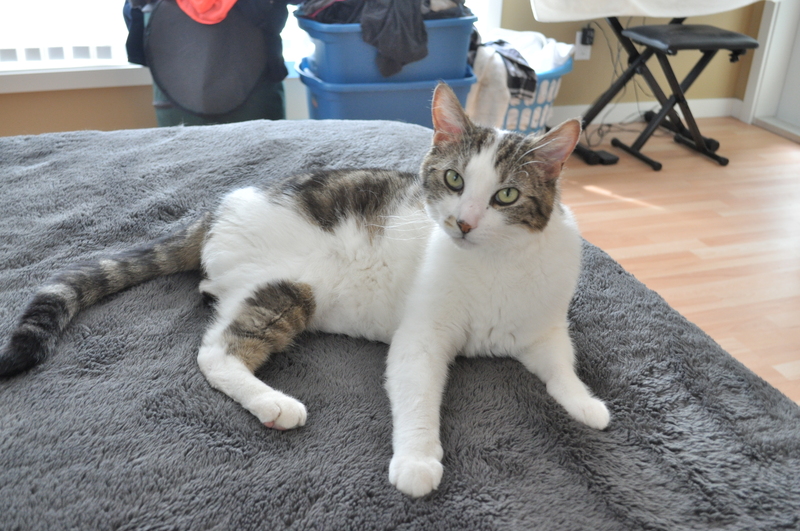 As to health, there is a post below by a visitor who refers to the disease Hepatic Amyloidosis that affects this cat breed to a certain but unknown degree. Because of this cat breed’s close association with the Siamese cat it is possible that it suffers from the same diseases to which the Siamese is susceptible (see Siamese cat health problems)5. 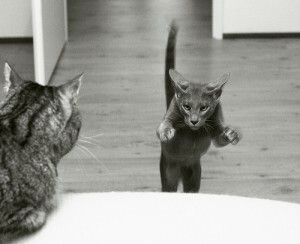 It is said the Oriental Shorthair cat is susceptible to upper respiratory illness and cardiomyopathy has been reported. It may affect certain lines5. This cat is low maintenance. They do require special attention as to their feeding habits6. 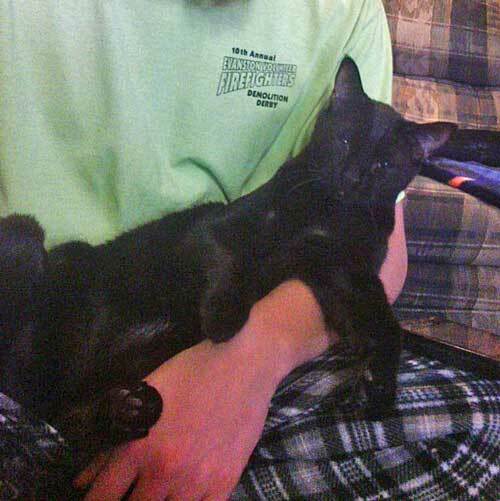 Paulchen Panther, possibly an Oriental Mix? Why does my cat scratch around his neck and ears? As my first love was an original Siamese, who died at the age of 3, I felt I could not have another Siamese as I was too distraught by the loss of him…. 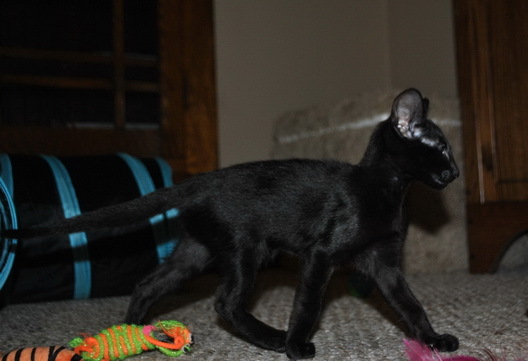 Is My Cat an Oriental Shorthair? As at 2008, I have been unable to find a breeder with a website that I can list based on my criteria, which is a Google search listing in the first 3 pages. The 3 listed where unsuitable. If you would like to be listed please contact me (see navigation bar on the left for relevant page). Hi Taylor, here is a slightly lightened up version of your photo. You have a very nice slender black cat with a Siamese like face – a long face. He is actually quite like my cat Charlie. I always say that my cat has some Siamese in him. That may be the case with your handsome boy. It is quite possible in fact. The Siamese is an ancient cat breed. There are many street cats in Thailand that are Siamese cats. They don’t have to be registered with an association although in America for a cat to be a cat breed and a pedigree cat it has to be registered. 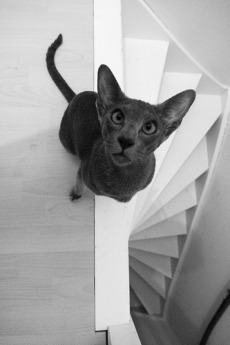 So my answer is, yes, he may well have some Siamese him. If he is vocal and a good talker and loyal that would seal the deal. Is my cat part oriental shorthair? He matches the description except that he doesn’t have large ears. He is very tall and slender, over a foot tall and 12 pounds.